Grand Hotel Hotel"England's finest resort hotel" - as described by the RAC. 152 bedrooms and suites, dramatic public areas including two restaurants and luxurious lounges. Facilities include a comprehensive health club with hair and beauty salon. Fully supervised children's playroom with full activity programme, including high tea during holidays and weekends. Unfussy but professional service as expected at this level. Beautiful rooms including 48 suites all with private bathrooms. Choice of restaurants; the Garden Restaurant serving traditional favouries with careful modern interpretation, and the Mirabelle, a Good Food guide regular, featuring cutting edge cuisine. A full Lounge and Room Service provide either formal or informal meals and light dishes according to your appetite and preference. Children are most welcome as is traditional at a seaside hotel. We provide a welcome satchel full of goodies such as games, sunglasses, and beach ball. Special meals are available all year with high tea served during school holidays. An OFSTED inspected playroom with professional staff ensures that children are properly looked after and entertained during their stay. 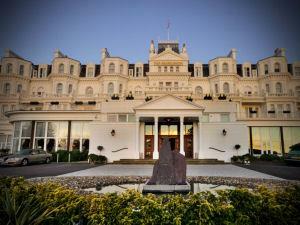 Many attractions both in the hotel and in Eastbourne have made the Grand a favourite and effortless place for familities. Temporary membership of the Health Club is included for all resident guests. Indoor and outdoor heated pools, spa bath, saunas and steam room and full gym are among the facilities as well as 8 health and beauty treatment suites with trained therapists waiting to massage your stresses away or provide a beautifying facial. Many other treatments are, of course, available including hairdressing. "England's finest resort hotel" - as described by the RAC. 152 bedrooms and suites, dramatic public areas including two restaurants and luxurious lounges. Facilities include a comprehensive health club with hair and beauty salon. Fully supervised children's playroom with full activity programme, including high tea during holidays and weekends. The Grand has 17 private dining and meeting rooms which regularly accommodate small intimate parties or international conferences. Special rooms include two semi-private balconies overlooking the famous great Hall where the BBC broadcast the programme "Grand Hotel" for many years. Health Club includes Gymnasium; indoor and outdoor heated pool, comprehensive hair and beauty therapy facilities and supervised (OFSTED inspected) children's playroom. Putting green on hotel lawns. Extensive on-site parking facilities. Children welcome from any age. Follow signs into Eastbourne to "the seafront". 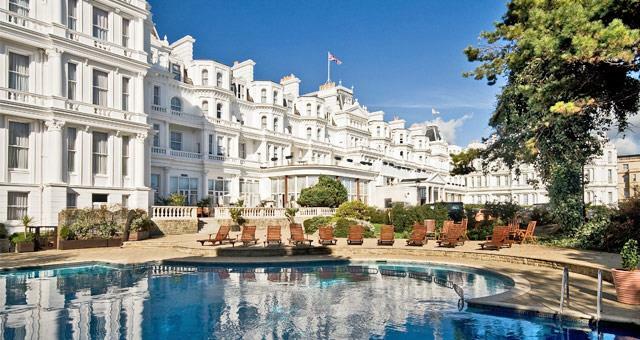 The Grand is situated at the western end of the seafront, set back from King Edward's Parade, within its own gardens. Eastbourne railway station is approximately 1 mile away.